There are a number of archaeology related events happening this coming weekend September 9 and 10, 2017. The 15th Annual Minnesota Archeology Fair will be taking place at the Fort Snelling State Park Visitor Center both Saturday from 10 am to 5 pm and Sunday from 11 am to 4 pm. The Fair will include a variety of poster and artifact displays, demonstrations and activities illustrating and explaining the archaeology of Minnesota. 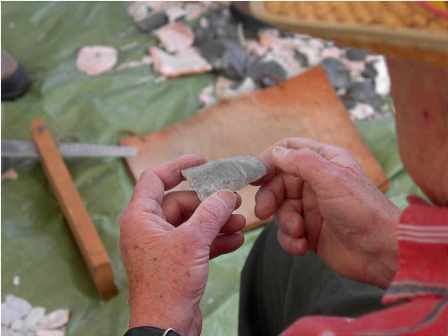 There will be artifact identification, an atlatl toss and demonstrations of pottery-making and flintknapping. The underwater archeologists from Maritime Heritage Minnesota will also be there with their visual exhibits and video footage from underwater archeological sites in Minnesota, ask questions of the only underwater archaeologist in Minnesota. The Jeffers Petroglyph Site will host an Archaeology Day on Saturday the 9th from 1 to 4 pm. Visit the Jeffers Petroglyphs site and see symbols and images carved into the stone outcrops by people in past times. Participate in an ongoing simulated archaeological dig. Kids can take part in a “Digging for Artifacts” program. And Whitewater State Park will host their annual Whitewater Valley History and Archaeology Festival on Saturday September 9th from 10 am to 4 pm. Take a step back in time to learn about the history of the Whitewater Valley. You will be able to participate in a variety of programs and hands-on activities including atlatl throwing, archery, cane pole fishing, old time tools and more.